The Patented Fish Head Shaker™ combines the realistic swimming action of our Fish Head Dude™ with the flash and vibration of our Original Fish Head Spin™. 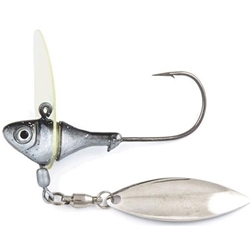 The Fish Head Shaker™ is an underspin that features a urethane bill that creates a wobbling action upon retrieval. The Fish Head Shaker™ can be fished at any water depth and around any cover. No species of fish can resist the flash of the blade and the swimming action of the Fish Head Shaker™!